The 100th birthday of Elisabeth Schwarzkopf falls on 9 December 2015. She died in 2006, but her recordings are a timeless treasure of the Warner Classics catalogue, like those of her contemporary and friend, Maria Callas. 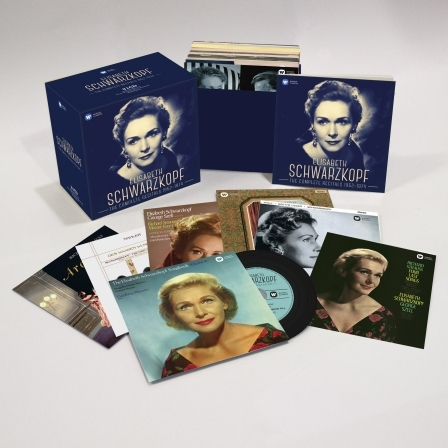 The 31-CD deluxe box set, Elisabeth Schwarzkopf: The Complete Recitals 1952-1974, to be released on 6 November, gathers together all the recital programmes of song, opera and operetta that Schwarzkopf recorded for EMI between 1952 and 1974 with Walter Legge – who became her husband in 1953 – as producer. Schwarzkopf and Legge conceived each programme with the greatest of care, and this collection respects and retains the integrity of every recital, with no recoupling or reorganisation of the tracks. In addition, the recordings have been remastered to the highest standards in 24-bit/96kHz: Schwarzkopf’s art emerges in all its beauty, refinement and detail. The collection comprises programmes of song, with both piano and orchestra, and programmes of operatic, operetta and concert arias. It contains two versions of Richard Strauss’s Vier letzte Lieder conducted by Otto Ackermann (1953) and George Szell (the 1965 studio recording, often regarded as the greatest in the catalogue). Encouraged by Walter Legge, Schwarzkopf developed into the leading female lieder-singer of her time, perhaps famed above all for her interpretations of the sophisticated songs of Hugo Wolf, and this box contains a programme of Wolf recorded in Salzburg in 1953 with Wilhelm Furtwängler at the piano. She remains unrivalled for her attention to the meaning of the words and to expressing it through subtleties of phrasing and tonal coloration. Such was her fame as a recitalist that she could sell out large venues such as New York’s Carnegie Hall and London’s Royal Festival Hall for a programme of lieder with piano. Her final appearance as a recitalist came in Zurich in 1979, but she continued to be active as a (sometimes redoubtable) teacher and her students included Thomas Hampson and Renée Fleming. The Complete Recitals also features sopranos Irmgard Seefried and Victoria de los Angeles; baritone Dietrich Fischer-Dieskau; pianists Walter Gieseking, Edwin Fischer, Gerald Moore (Schwarzkopf’s favoured accompanist), Geoffrey Parsons and Alfred Brendel, and conductors Herbert von Karajan, George Szell, Charles Mackerras, Otto Ackermann and William Walton. Walton originally composed the role of Cressida in his opera Troilus and Cressida for Schwarzkopf, though she never sang it in the theatre. Rather like Warners’ Callas box-set, each individual recital is presented in a sleeve with its original artwork. The comprehensive illustrated booklet features essays by three distinguished writers, all acknowledged experts on Elisabeth Schwarzkopf: Alan Sanders (English); André Tubeuf (French) and Thomas Voigt (German). Elisabeth Schwarzkopf’s complete 78rpm recordings will be released by Warner Classics in 2016.